Boulder, Colorado. August 5, 2014 – The Ball Aerospace, DigitalGlobe, Exelis and Lockheed Martin Commercial Launch Services team have successfully moved one step closer to launching the next-generation WorldView-3 commercial remote sensing satellite. 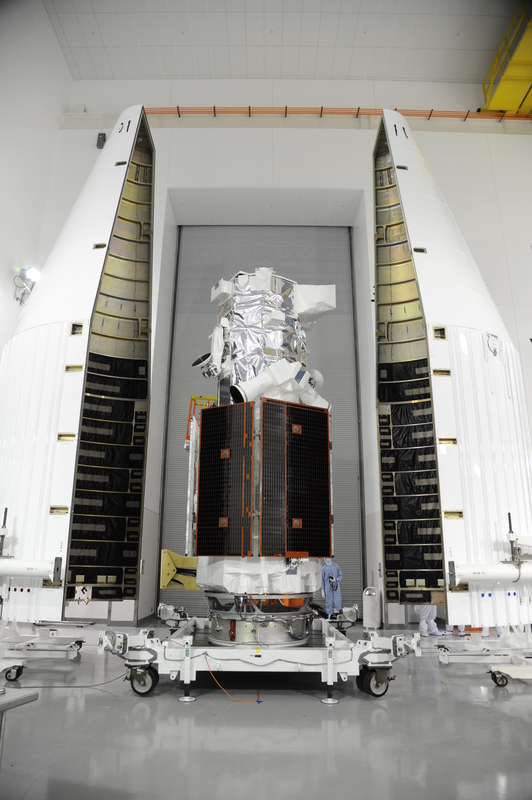 DigitalGlobe’s WorldView-3 satellite was encapsulated within the rocket fairing by engineers on July 25, and the satellite is now scheduled to launch on August 13 (11:30 a.m. PST) from Vandenberg Air Force Base, California. WorldView-3 is the first multi-payload, super-spectral, high-resolution commercial satellite for earth observations and advanced geospatial data. Operating at an expected altitude of 617 km, WorldView-3 will collect imagery with 31 cm resolution. The payload fairing assembly has been transported to the launch pad and mated to the 57-meter tall Atlas V launch vehicle provided by Lockheed Martin. WorldView-3 will carry the Exelis-built 1.1 m aperture telescope and the primary visible/SWIR sensor, as well as the Ball Aerospace-developed CAVIS instrument, which stands for Clouds, Aerosol, water Vapor, Ice, and Snow, which will monitor the atmosphere and provide correction data when atmospheric conditions obscure objects on earth. As with the previous DigitalGlobe satellites, Ball was also responsible for development, integration and testing of the WorldView-3 satellite. DigitalGlobe recently received permission from the U.S. Department of Commerce to sell even higher resolution satellite imagery. Once operational, WorldView-3 will provide the commercial market images with significantly greater clarity and spectral depth than anything previously available.